1 Start the sauce by finely chopping the onion and garlic. Heat oil in heavy based pot. Fry onion and garlic until translucent and fragrant. 2 Add passata to the onions and garlic, and cook for approximately 30 minutes on a slow simmer. Stir as needed. Skip ahead to start the meatballs while the sauce is simmering. After a half an hour, stir in the meatballs and diced tomatoes and cook for a further 15 minutes. Tear the basil leaves, and add to the sauce. Simmer for 15 more minutes and season to taste. 3 To make the meatballs, place mince in a bowl and add egg, Parmesan, breadcrumbs, garlic and herbs. Using your hands, mix together until well-blended. 4 Flatten a handful of meatball mix in your palm, nestle a Bambini Bocconcini ball into the centre, and roll the meat around it, making 20 meatballs in total. 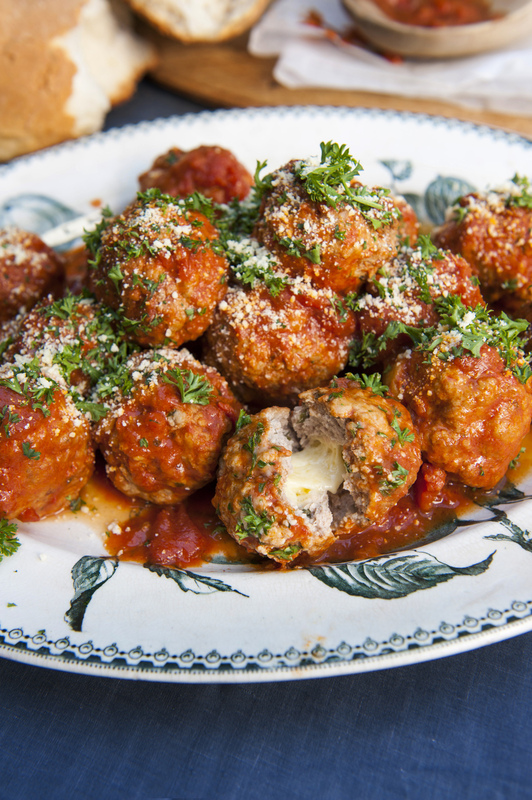 Meatballs should be about the size of a golf ball. 5 Heat 3 centimetres of oil in a frying pan and cook the meatballs lightly to brown them off. 6 While Napoletana sauce is cooking on stovetop, drop meatballs into the pot carefully, trying not to splash sauce. Reduce sauce to a simmer, put lid on the pot, and simmer for 30 minutes until meatballs are tender and cheese is delicious and runny.